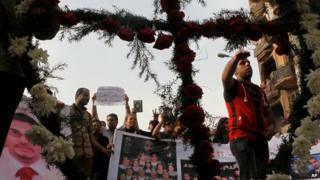 As tensions rise again in Egypt, the country's Christians are dreading a further backlash. But since President Mohammed Morsi and his Muslim Brotherhood were removed from power by the military in early July, Islamist extremists have targeted Egypt's Christian minority, holding them partly responsible. The Coptic Pope, Tawadros II, has received death threats, while several Christians have been killed. At St Mark's Cathedral in Cairo on Sunday, dozens of children gathered for Bible study. Security at the gates was tight, after an attack there earlier this year. Last Tuesday, 10-year-old Jessi Boulus was walking home from her Bible class in a working-class area of the capital when a gunman killed her with a single shot to the chest. For Jessi's parents, the grief is still almost too raw for words. She was their only child. Both try but cannot hold back the tears as they describe their daughter. Her mother, Phoebe, believes that she was targeted purely because she was Christian. "She was my best friend, my everything. Jessi was just becoming a young woman," she says. "Every woman dreams of becoming a mother, and for 10 years I was lucky enough to be a mum. I'll miss Jessi calling me mum - I know I won't ever hear it again." Jessi's father, Boulus, veers between grief and despair, as he recalls the hatred that changed their lives forever. "Jessi was everything to us. Her killers didn't know that Jessi was my life - my future. They killed our future. I lived for her. We both did," he says, unable to conceal his emotion. The couple say that in recent months, Jessi had begun to worry about her own safety, aware of the tensions on the streets. The family had talked about emigrating, but made a conscious decision to remain in Egypt, their home. Boulus, though, says that a climate of increasing intolerance created by Islamic fundamentalism led to his daughter's and other deaths. "I'm telling you in the West that your taxes and government money go towards supporting the killing here - by funding Islamist political parties." Though Muslims and Christians stood together in Tahrir Square in July, radical Islamists have blamed Egypt's ancient Coptic Christian community for helping to remove President Mohammed Morsi from power. At another church in Cairo, St Cyril's, the walls outside are scrawled with graffiti. Inside, Father Antoine Rafik Greiche is praying for his Melkite Greek Catholic flock as he prepares for the evening service. He explains that the cross and the crescent have co-existed, mostly peacefully here, for well over a thousand years, especially in the 18th, 19th and much of the 20th Centuries. But he, too, says radical Islamists are now scapegoating Christians in Egypt, as well as other Muslims who disagree with their views. "The fall of President Morsi and the Muslim Brotherhood was a release for Christians," he says, explaining that many Muslims and Christians felt that early promises made by the Morsi government were never fulfilled, leading to the mass popular demonstrations against his rule. "But at the same time, since then it's become more dangerous because some in the Muslim Brotherhood now want to prove themselves by using force and violence. We are doing our best to bear it, but young children and others are paying a high price." After deadly clashes outside Cairo's Coptic cathedral in April, Mr Morsi phoned Pope Tawadros to condemn the violence. He also called for an immediate investigation. But Egypt's Copts and other Christians feel increasingly vulnerable, as do Christian minorities in many other parts of the Middle East, such as Syria and Iraq. Christians make up at least 10% of the population in Egypt, or well over eight million people. According to figures from Amnesty International, Jessi was one of seven Christians killed in sectarian violence in Egypt over the past few months, while shops, homes and Christian businesses have also been targeted. One church in the central town Minya was burnt down; the black flag used by jihadist militants raised over others. Diane Eltahawy, Amnesty International's Cairo-based North Africa researcher, asks why Christians are not being properly protected. "We are concerned that these attacks are happening in a climate of impunity, with security forces standing idly by while people are being killed, while their properties are being looted," she comments. "They only give lip-service to attacks on Christians, and actually don't take any concrete action to combat the prevailing discrimination that exists in policies and society here."